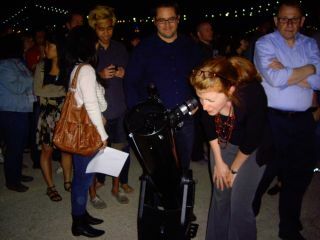 Danielle Pollaci of Brooklyn looks skyward through a telescope at the World Science Festival's "Night of Stargazing at Brooklyn Bridge Park." NEW YORK — New York City is a great place for spotting movie stars. As for the celestial ones, though, not so much: The night sky above the city that never sleeps doesn't get very dark. But that fact doesn't keep diehard skywatchers from looking up. "Right now there aren't very many stars visible," Linda Prince, an amateur astronomer from Long Island, told SPACE.com. "Just a handful here." Prince was one of approximately 500 stargazers on the banks of New York's East River Friday night (June 3) for "A Night of Stargazing at Brooklyn Bridge Park," an event held as part of the 2011 World Science Festival. Attendees waited in long lines for the chance to look through telescopes pointed at the few celestial objects that did show themselves — including the bright stars Vega and Arcturus, and the ringed planet Saturn, which for obvious reasons turned out to be the crowd favorite. Siblings Patrick and Grace Cognato made the trek to Brooklyn all the way from Staten Island to look through the telescopes. "We saw the rings of Saturn and we saw double stars," Patrick said. "That's two stars orbiting each other." Before the stargazing got under way, a panel of experts regaled the crowd on the joys of astronomy. They each gave their take on what those little points of light up there actually are. "They're suns," said Timothy Ferris, an award-winning astronomy book author and documentary filmmaker. Suns are thermonuclear devices, he explained, which undergo fusion reactions that spew heat into space. Stars that twinkle with a blue-ish hue burn hotter than those that look red, he explained. "They are so many different things for me. They are songs, they are poems, they are beauty," said Charles Liu, an astrophysicist at the City University of New York's College of Staten Island. "A star is a factory that creates the building blocks that make us who we are. Every atom of carbon, iron and calcium in our bodies was formed in those nuclear processes that Tim described and then sprayed outward into the universe over billions of years." Carter Emmart, an astronomy artist at the Hayden Planetarium at the American Museum of Natural History, said, "Our view of the universe is also sort of a time machine, because light travels at a fixed speed." He pointed out Arcturus, a yellowy-orange star that appeared in the eastern part of the sky. "That light you're seeing left 40 years ago. So if you're 40 years old, that light left when you were a baby." "Wow, thank you, I'll take that!" said a 40-year-old woman in the audience. "It has been said that there are more telescopes in New York than any other location. Everyone jokes that a lot of people must be looking in other people's windows," Freeman said. "But actually, astronomy and stars, I think people always have an interest in them. When I tell people I'm an amateur astronomer, they always say 'yeah, stars!' Even when they don't see them, they still have an interest in knowing what's going on up there." Natalie Wolchover is a staff writer for Life's Little Mysteries, a sister site of SPACE.com. Follow SPACE.com for the latest in space science and exploration news on Twitter @Spacedotcom and on Facebook.